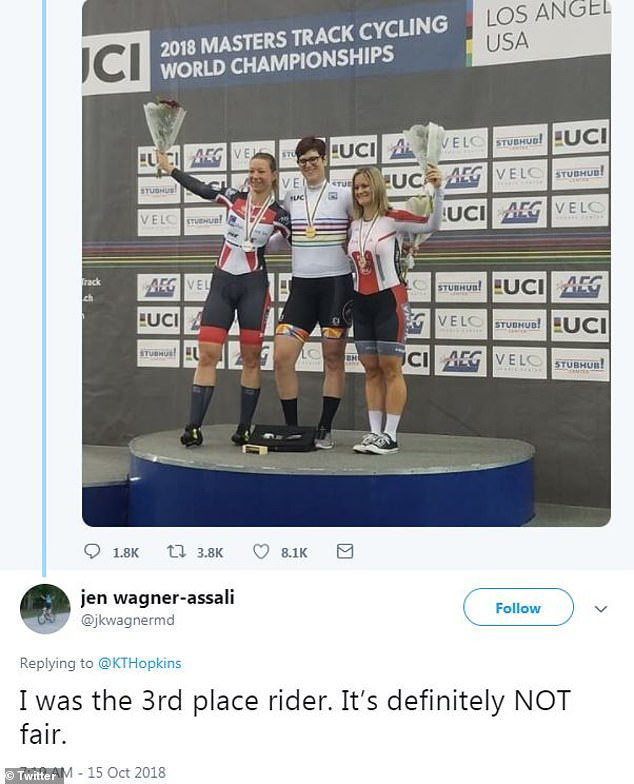 Jen Wagner-Assal, the UCI Masters Track World Championship cycling bronze medalist, has complained about coming third-place and losing out to a transgender. Wagner complained on Twitter that 'It's Not Fair' that she lost the top stop to a transgender woman. Wagner, 38, received a harsh backlash from her comments on her placing after trans woman Rachel McKinnon, 36, who became the first transgender to win the Championship. 'I was the 3rd place rider. It's NOT fair,' she wrote. 'I was the third place rider. It's definitely not fair,' she added. The cyclist then apologized for ger public comment after the Tweet went viral. 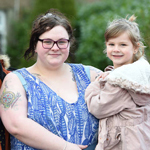 'After having some time to reflect, I realize my twitter comments earlier this week unintentionally fanned the flames on a controversial situation, and that I regret,' she wrote. According to the DM: The champion Canadian athlete was supported by the woman who reached second and took home the silver medal. Carolien van Herrikhuyzen stated it was an 'honest' race and that Wagner should not have taken part if she had a predicament. 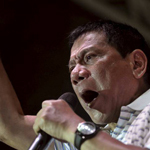 'No one is a transgender to steal anyone's medal,' van Herrikhuyzen wrote. But she later added in her tweets that she should be a bigger sport. However, Wagner-Assali's comments appeared to take an uncaring turn as she reinforced her judgment that McKinnon is not female. She seemed to imply having the winner take part in the race was akin to having a man compete and repudiated her harsh stance by then seemingly stating she needed to learn from her earlier opinion which did not go down well with those who back the trans identity. 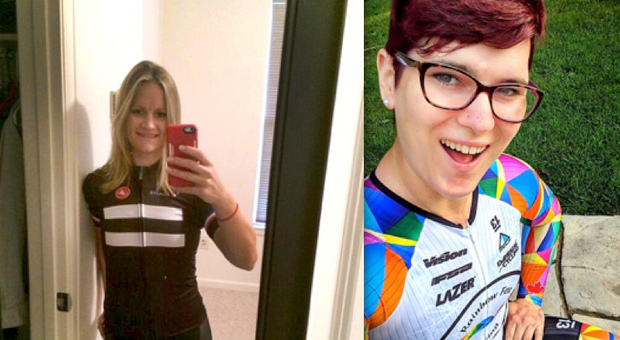 'I'm sure there are men who don't agree with the USA Cycling rule that women can enter their races, which I do all the time,' she wrote on the micro-blogging site. 'I appreciate those that have reached out to support me, but please stop directing hateful or derogatory comments toward Rachel or trans people in general. McKinnon chimed in after her sore competitor added another offense by appearing to tell her followers she was still preparing to protest the inclusion of trans women in her races. Explaining what she meant by being 'positive', she shared she was still taking action against. 'For those of you who think I have 'folded' I have not. There's a group of us working on getting the rules changed, but we are going to fight it offline, not in the name-calling angry world of social media. 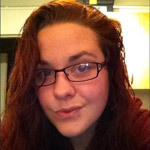 I'm choosing to move on in a positive way,' she wrote. Adding that the women fighting her inclusion in the sport should face a penalty for breaking the rules of USA Cycling, she shared that they had carried out the specific behavior the rulebook states is not allowed. 'I've been humiliated, they make me feel unwelcome at races, and saying that it's unfair (when I follow all the rules) is degrading and disparaging,' McKinnon tweeted. Cycling isn't the only sports McKinnon loves; she was a junior provincial badminton champion, regional junior golf champion and club champion, won sport climbing competitions and was a professional poker player for six years. She started racing at a professional level when she was ten years old. Writing 'Trans women are women. We must compete as women. We have rights, too,' McKinnon later related her struggle to civil rights racial struggles. 'White people thought it was UNFAIR for black people to compete in the sport. 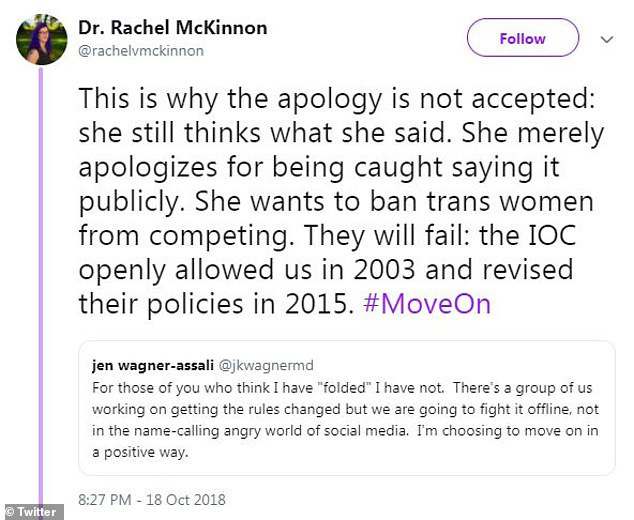 The very same tactics are being used against trans women athletes,' she posted. The Union Cycliste International responded Friday in a statement that shared how the rules recognize hormone therapy over gender reassignment and that the guidelines will be explained later on. 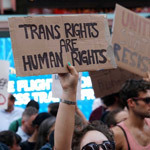 'Although there are no queries concerning Women-Men (W-M) transgender athletes, whose situation – at UCI level as for all International Federations (IF) – is controlled by therapeutic use exemptions (TUE), the current situation concerns M-W transgenders,' they wrote. 'After some 18 months of substantial work, and after consultation with the IFs, the International Olympic Committee (IOC) should shortly announce guidelines incorporating the partnership of M-W transgender athletes. This document should allow us to take into consideration, in line with the evolution of our society, the passion of these people to compete while at the same time guarantee as far as possible an equal chance for all participants in women’s competitions.